Now that Spring is here, it's a given that our makeup routines are going through a massive transformation. Out with the rosy red cheeks and light setting powers and in with the coral blushes and glowy bronzers. 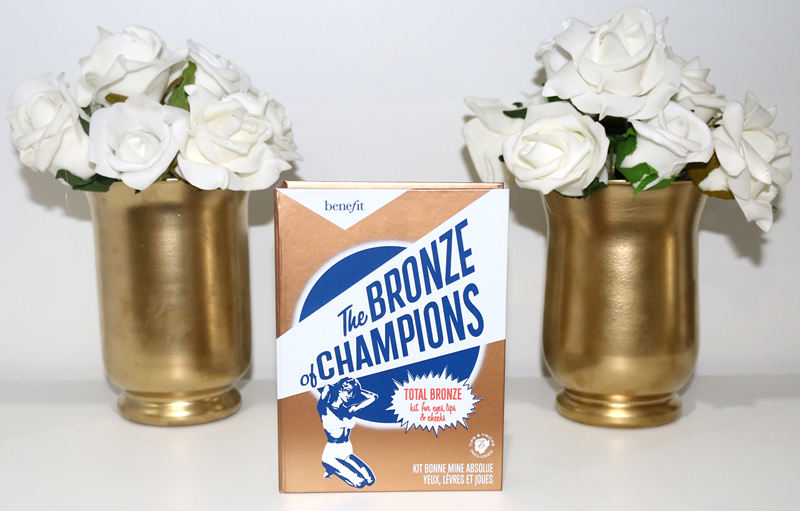 There's no better set to amp up your sunny weather makeup game than the Benefit The Bronze of Champions. This kit has you covered from lashes to lips with an array of some of Benefit's most famous products. Included are six amazing products (and a brush) that are sure to leave you bronzed and glowing. Let me tell you, most of these are very hype-worthy including the Hoola Bronzer and They're Real mascara. Creaseless Cream Shadow in "Bikini-Tini"
This sort of product is a definite go-to during the warmer weather since caking on powder eyeshadows can seem a bit much for everyday. I tend to opt for a cream product that I can quickly swipe on and is sweat-proof so won't budge. I love the golden champagne colour of this particular shade because it brings luminance to the eyes for a bright and awake appearance. Here we have come to the super famous Hoola Bronzer of which I would know about Benefit without. It was the first ever product that introduced me to the brand and I have heard nothing but good things about it. This is probably due to it's rare matte formulation and the fact that it's so versatile in the way that it works on an array of different skintones. You can read my full review on this product here. I love highlighters; from liquids to powders I am all for their luminescent magic. This stick formulation highlighter is the most stunning candlelit bronze shade and I immediately fell in love. Luckily I was not disappointed with the way that it wears and looks since it's an easily blendable product and leaves a gorgeous natural glow to your cheekbones or wherever else you decide to place it. An absolute cult classic, this super-hyped mascara is of course included in this set as no look is complete without it. Super black, volumised and long lashes can be expected by using this product. Longwear Powder Shadow in "Thanks-A-Latte"
As far as I can tell, this is a full-sized eyeshadow which retails for $29 each so that's already half of the cost of the set in only one product. I adore the colour of this deep shimmery brown shade and can see it being a gorgeous crease colour for sultry bronzed looks. Ultra Plush Lip Gloss in "Hoola"
Matching your lip colour to your bronzer? Yes please! Don't let your lips miss out on the bronzy fun and apply some shimmery Hoola lip gloss for a glowy sparkle to your smile. My overall thoughts are that this is the perfect set for the faired skinned gal since these subtle bronze shades work well on pale complexions but may not be deep enough to satisfy darker skins. For $59 it is easy to look over this set but you must take into consideration how many products are included in the kit. There's also the fact that it gives you the opportunity of trying an array of different products that way you're able to decide if you would like full sizes instead of dishing out the cash for each product. It's less than $10 for each product not even including the brush, so I was shocked by the great value considering most of these full sized retail between $30-$50 each. 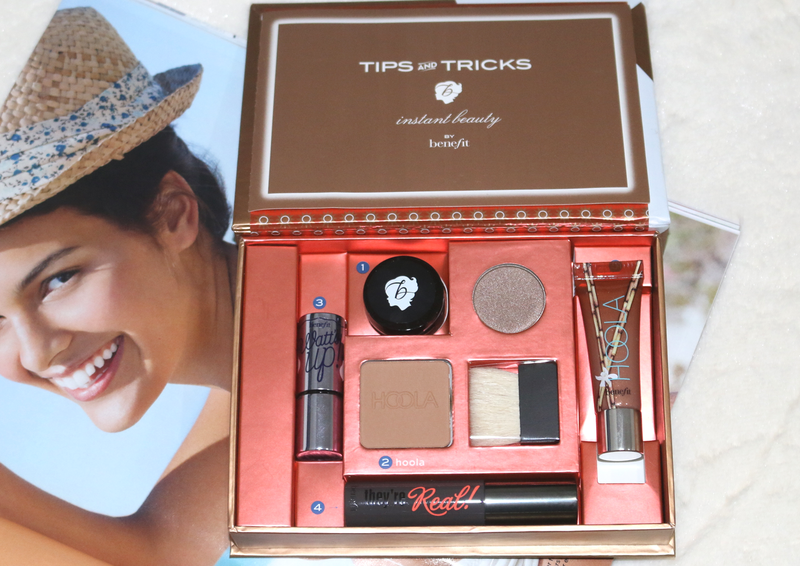 This kit can be purchased from any Benefit counter such as those in Myer and David Jones. This looks absolutely lovely, perfect for summer.